Look at the wedding photos taken at our indoor banquet hall in Buffalo Grove, IL, and you’ll see why so many couples have chosen Astoria Banquets & Events for their celebration. If you’re looking for a unique, glamorous, timelessly elegant, chandelier-filled, wow-inducing and affordable wedding venue in the Chicago suburbs . . . Astoria Banquets & Events is perfect for you. 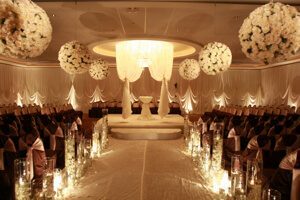 At our indoor banquet hall in the Chicago area, your wedding will be affordable and easy to plan. We’ll take care of your food, drinks and decorations, so you can enjoy your wedding day. Wedding Reception packages start at only $56 per person for evening wedding receptions, including your wedding cake, open bar and more. All-inclusive packages are designed to offer you real value and allow you to choose your level of service, in accordance with your list of wedding must haves and your budget. 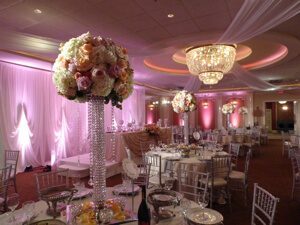 Astoria Banquets & Events has remained one of the most affordable banquet halls in the Chicago suburbs and Chicagoland area. And yes – we do more than weddings! Fill out the short form below or call at (847) 392-7500, and we’ll help you plan any event, within almost any budget: wedding reception and ceremony, bar/bat mitzvah, quinceanera, holiday party, communion, baptism, rehearsal dinner, cotillion, baby shower, bridal shower, engagement party. Special rates and shuttle services may be arranged with nearby hotels to make it easy for your guests to enjoy your event at our banquet hall in Buffalo Grove, IL. Buffalo Grove is a central location: near Schaumburg, Arlington Heights, Palatine, Wheeling, Des Plaines, Mt. Prospect, Rolling Meadows. We’re near the major expressways, and because the venue is fabulous, our clients also travel from Chicago, Oak Lawn, Aurora, Elgin, Cicero and more locations. YOUR CEREMONY & RECEPTION in ONE LOCATION? The ALL-INCLUSIVE approach is EASY! And it’s what we’re known for! Your wedding day is like no other day. And Astoria is a venue like no other. So it’s a perfect match! At Astoria, you’ll get a wedding ceremony setting worthy of your I do. Here’s how to have the best wedding at Astoria on a budget. We do more than weddings! So get social at Astoria with event spaces for 30-400. See how happy we’ve made our clients. You can be next! Your questions, answered right now.